Savage lizardfolk from the coastal swamps, the Reptisaurians are new to the forces of Darkness, but are still fiercely loyal. While they usually keep to themselves, the call of the Darkness was too tempting for these cold-blooded killers. Their spiritual leaders became agents of Darkness, but the mighty Retisaurian Rex still reign as undisputed "kings". Armed with poisonous blowguns and swords, they have crawled out of their swamp to bring terror to the land. This Enemy Box contains two additional Mobs (Boss and Minions) an Agent, and a Roaming Monster, along with their game cards for Massive Darkness. Reptisaurians are ruthless predators; they use poisoned darts and vicious blades to make sure their prey can't oppose their physical might. 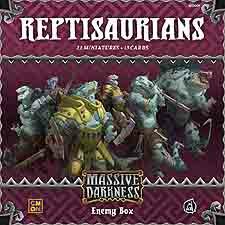 6 Reptisaurian Warrior Minions + 1 Reptisaurian Warrior Boss + 12 Reptisaurian Blowgunner Minions + 1 Reptisaurian Blowgunner Boss + 1 Reptisaurian Agent + 1 Reptisaurian Rex Roaming Monster + 13 Cards.